Families, friends, and entire communities feel a sense of urgency, and want to move quickly to resolve the disappearance of a missing loved one be it an adolescent, adult or a senior citizen and rightfully so. But during an emergent situation families and friends tend to reach out to everyone and anyone in the hope that they can and will assist during the crisis that includes online advocates, pod broadcasters, flier creators, YouTube video creators, self-proclaimed private investigators, those that claim to be non-profit organizations and foundations, just to name a few that are well meaning and do care. Then there are those unscrupulous individuals that are just waiting in the wings to pounce on the vulnerable. We urge you to use extreme caution when selecting who you desire to be part of your missing loved one’s team to assist you. Here are some pointers to keep your loved one’s case safe while endeavoring to pursue your goal of receiving assistance. Do a background check prior to asking for assistance from any one person or group. If you arbitrarily jump into a situation without doing your research, you may discover you have entered a pit of despair dealing with unnecessary chaos from unprofessional individuals that have now linked their name to your missing loved one’s case. Once that occurs it is the same as attempting to stop a runaway freight train. Under no circumstances do you want your case to become alienated from law enforcement for any reason whatsoever. Even when you feel that law enforcement does not have your loved one’s best interest at heart they do care they too are human beings with families, children, mothers, fathers, sisters, brothers etc. They are trained to separate their feelings from the job at hand and to use their critical thinking skills to find your missing loved one. So, try not to be offended if the officer on the opposite end of the telephone line seems aloof or disinterested when you call. Trust us they are taking the information in and processing it logically to see if it matches their theories of what potentially may have occurred leading to the disappearance of your loved one. All reliable credible leads are followed even if they do not share this information with you. Be direct ask the person or organization to provide you with their credentials. No professional will take issue with your request. If there is hesitancy on their part then move on and do not look back. If they proclaim to be a private investigator ask them to provide their licenses number and check it out via the state the license was issued in. Perchance they proclaim to live in a state that does not require a license there are still methods in which to check their credibility a good place to start would to be to ask the investigating officer if he can assist you. If they proclaim to be a professional advocate ask for reliable references from others that can validate their professional position. If they state to be a non-profit it is easy enough to check that out via the federal government and or state in which the foundation or organization resides. Just because someone is a non-profit does not make them a good non-profit. Never under any circumstances accept assistance from those that approach you with their offers of assistance. Unless the offer was made on the recommendation of law enforcement, another reputable organization or foundation. Make sure to get the name of the individual that recommended them to you and take a few moments of your time to check it out with the individual that recommended them prior to speaking with them period. You should never allow a well-meaning stranger to set up any kind of fundraiser account in your loved one’s name. If you need monetary assistance during the crisis there is a proper way to handle this please read our section on Monetary Donations. Never reveal any details of your case without first conversing with law enforcement, ask for their guidance on what you should or should not say. The reason for this is that it could compromise the efforts being made to locate your loved one. Never share confidential information with the public no matter how much you desire to do so out of desperation to find your missing loved one. Only put forth the information that law enforcement and your family has agreed upon. No one has the right to know all the details of your loved ones case be it media, well-meaning prayer groups, advocate groups, even friends, extended family members or neighbors remember to think before you speak. If they are sincere in their motives they will not take offense if you simply state that you are unable to provide information to them. You do not have an obligation to explain any further than that simple statement. If they continue to push the issue just excuse yourself completely from the conversation. Do not respond to unsolicited messages asking for details or those making accusatory remarks towards you, your family members or the missing person. Everyone is under extreme duress and the last thing that you need is to deal with are trouble makers that want nothing more than to cause you grief. Social media has two sides one is a God send to get information out quickly the other side can be a pit filled with verminous rattle snakes just waiting to strike. Tip lines are exactly what they are meant to be that is for the flow of incoming information, tips, leads. Tip lines should be left to law enforcement or other reputable organizations such as NamUs and NCMEC. If by chance you were to receive a call on your personal phone keep a pen and note pad handy to write down everything that was stated once they have finished providing you with the tip, notify the investigator on your case. Relay to him or her what phone number received the call. The time and date the call was received and if the incoming phone number was displayed on your phone. Do this also for hang up calls when no one is on the other end or does not respond to your answering your telephone. Try to also listen for background noises, make note if it was a male or female voice if any. Keep a notebook handy to maintain all notes. Unless the private investigator agrees to accept your case and perform pro bono services which surprisingly some do out for children and adolescent cases, if not the fees can be quite costly depending on the circumstances surrounding the case. Keep in mind that private investigators often charge for all expenses incurred while working on a case, time, travel, telephone conversations etc. never ever agree to anything blindly. Make sure everything agreed upon is written out in a contract in black and white and signed by all parties. Never make a verbal agreement, hand shake agreement and never hire anyone sight unseen. Meet with the individual and get a feel for his or her style of conducting business, ask probing questions of what their plan of action is and the timeframe involved in implementing their plan. The only time that a private investigator would be appropriate is when law enforcement has deemed the case unsolved and it has been reclassified as a cold case or that law enforcement informs you that they do not have the manpower or finances to continue actively working the case. Even then continue to return to them never let them entirely place your loved ones case out of sight out of mind in a file collecting dust. Our suggestion to you is prior to a physical meeting with or hiring any Private Investigator make sure that you check out their credentials as aforementioned with the state, the better business bureau and always notify law enforcement of your intentions prior to securing any private investigator. There are many private investigators out in this world, some are excellent and others are not worth the ink that their licenses are printed on. We highly recommend going with individuals that are professional retired law enforcement, retired F.B.I. agents, retired military law officers, and seasoned professionals that have been in the profession and practice for an extended period because they will have proven track record, extensive work-related background and experience. After a discussion with law enforcement consider assigning someone within your family or a close friend to be your public information officer, they will be responsible for disseminating all agreed upon information on your behalf during media interviews and public announcements. Make sure it is someone that is articulate and that can handle extreme stress. This is important for the welfare of your family’s wellbeing to have someone other than yourself speaking with the public, unless of course you feel confident enough to be able to handle the onslaught of questions. Do not waste your strength or energy on organizations, foundations, advocates, or others that feel it is necessary to vocalize their viewpoint to you as to why you should not associate with A, B, or C just do your own homework, feel comfortable in your selections as to who will make up your case team and do not go by rumors, hearsay or promises. Stay clear of internet social media drama at all cost. Trust us you do not need it, you will need all your strength to survive the situation that you are facing. There are many reputable groups that do not carry 501c3 status and that is because they are not actively fundraising nor are they receiving copious amounts of money which requires such groups to report to the IRS for non-exempt tax purposes. There are sincere hardworking professionals that are donating their own time and professional talents on a volunteer basis who charge nothing and are paid nothing all cost incurred is pay for out of their own pockets or any and all donations received are directly put to good use to assist another family with their loved ones website. We do not promote the use of Psychics, Mediums and Astrology period. That is strictly something that you and you alone must decide but we advise you to use extreme caution when dealing with these proclaimed seers. Example: When Christopher first disappeared, we were contacted by a psychic that declared our son was deceased inside of an abandoned tunnel that trains use to run thru. She provided vague information pertaining to the area in which he would be found. Nothing concrete for which to go on. This was a major stress inducing experience to have a total stranger contact us and inform us our child was deceased. It took a very long time to overcome that call and if you read Christopher’s story you too now know he is alive. So, we do not put faith in that type of practice, while we are sure there are some that can and do pinpoint exact information that is valuable to law enforcement we opt not to promote this type of practice. If ever approached with such claims of knowing the whereabouts of your missing loved one our suggestion would to be to stop them right in their tracks do not listen to the seer's proclamations and direct them to call your assigned law enforcement officer with the information, this will save you a lot of wear and tear emotionally, mentally and physically. Identity theft is on the rise therefore protect your missing loved ones information from everyone and only provide that information on a need to know basis meaning law enforcement agencies only. The age of the missing person suffices no birthdates should be shared with anyone. This is to protect the integrity of the case and to thwart identity theft attempts. Social Security numbers are never needed either by anyone at any time safe guard that information from all. Example of what not to do! 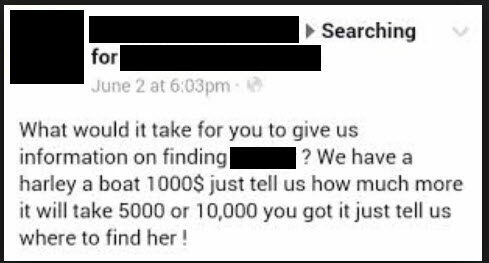 We discovered this on a Facebook page while doing research on one particular case and were left speechless. The following is some tried and true advice from experts when it pertains to Monetary Rewards. It's hard to assess the true value of a reward in recovering a missing loved one. The offer of a reward might renew media interest in reporting on a missing loved one, or it might be the thing that motivates a person living on the fringe of society to call in a lead. Although rewards do not always produce the right leads or have the anticipated results, the use of a reward may be worth considering. This section discusses some important issues for you to think about before setting up a reward. It explains how to manage reward funds correctly and where to go for help or advice. Regardless of the odds that a reward will work, most parents will want to offer one if they possibly can to turn over every stone in the search to find their missing loved one. However, many issues need to be considered before an informed decision about a reward can be made. Get expert help. Because of the number of legal and technical issues that can arise from a reward offer, you need expert advice from a knowledgeable attorney, your primary law enforcement contact, your banker, and the parents of other missing loved one who have successfully established a reward fund. Make sure that the people who give you advice have firsthand experience managing a reward fund. Be aware that your reward offer can become a legally enforceable contract. If you offer a reward, you are agreeing to pay a sum of money if a person's actions lead to the requested result. That means that anyone who complies with the terms of the offer can be legally entitled to claim the reward and can sue for its recovery. That's why you must be very careful in how you describe the terms of the reward offer. Sloppy language can result in serious legal problems. Ask an attorney for pro bono legal assistance. Be prepared to meet resistance from law enforcement. Some law enforcement agencies disapprove of reward offers because they can result in a torrent of false leads. Keep law enforcement informed of any decision you make regarding a reward, and if you sense concern or resistance, point out that all it takes is one solid lead to recover your loved one. Also, the desire for reward money could motivate an abductor to keep a child alive. Clearly state the purpose of the offer. First decide what you want the reward to accomplish, then make sure that this purpose is clearly spelled out in the offer. For example, it is a good idea to make your child's safe return a written condition of the reward. The better the description of the reward's purpose, the less likely it is that you will have to argue later over whether someone complied with the terms of the offer. Set a time limit for the reward. One of the goals of a reward is to generate immediate results to get your loved one back quickly. In the beginning, you may want to keep the time limit short and tie it to a significant event, such as your loved ones birthday. The drama of such a countdown could generate substantial public interest. Avoid open-ended rewards that can result in liability many years later. You can always renew the reward for a longer period. Be careful in establishing the amount of the reward. Don't offer more money than you can afford to pay. Decide on the maximum amount of the reward in the first offer and stick to it, because if you raise the amount later, people may wait for a more lucrative offer before calling in a lead. Check to see if special reward funds already exist. Sometimes State and local agencies -- and even the FBI -- have funds available to put up as a reward in cases involving predatory abduction. Ask your law enforcement contact to help you find out about such funds. Be aware that monetary pledges are not as reliable as donations. It is much easier to persuade people to pledge money toward a reward than it is to get them to donate cash. Therefore, you can in theory raise much more money through pledges than you can through donations. The problem is that you cannot be sure that a pledge will be honored when the time comes to pay out the reward. If you use pledges, get the pledge in writing, pay attention to the expiration date of the pledge, and plan to spend a fair amount of time making sure your pledges are still legitimate. Pledges are not forever. Do not use your personal funds to finance the reward. As hard as it may be, refrain from using your own personal funds for the reward. Based on the terms and conditions spelled out in the reward offer, you may be liable for payment of the reward, and you may even be sued. And though you may not realize it in the beginning, you may be faced with financial constraints months or years later, for example, if you are out of work for an extended period helping in the search for your loved one. Monetary donations can be extremely helpful to families whose lives have been turned upside down by the disappearance of a missing loved one. They can be used to help finance the search, fund a reward, or support the family if unable to work during the search process. But donations can also present problems if they are not managed properly. For this reason, you need to be aware of some important accounting and accountability issues that, if not handled correctly, could result in legal and financial ruin. Make sure that both you and your contributors know how the money will be used. Donations can be used for many different purposes, depending upon your need. Ask that donations be earmarked for a specific purpose -- such as the reward fund, the search fund, or the family support fund -- and if they are not, ask one of your volunteers to call the donor to find out to which fund the donation should be given. Seek professional help from both a lawyer and a banker to help you establish separate trusts and accounts and to oversee disbursements. Keep separate bank accounts for each fund. If accounts are set up properly, donors will feel comfortable that records of the money are being kept and that donations are being used for the specified purpose. Creating a trust fund -- or at least establishing safeguards, such as requiring dual signatures on checks and maintaining accurate records -- is crucial. You must make sure that funds earmarked for a specific purpose are, in fact, being used for that purpose. Avoid having direct control over any funds received. Families should not solicit funds on their own. Use volunteer groups for this purpose instead. Families also should not have any signatory control over the funds, because there have been instances in which someone attempted to extort the reward money from Families by force. Protect yourself from this kind of danger by putting the money, and the power to access it, in someone else's hands. Designate trusted individuals outside the family to have signature authority over the accounts. By removing yourself from the control of the funds, you eliminate any unnecessary scrutiny by members of the public or the media about the use of the funds. Make sure that the individuals selected for this task are trustworthy and that they understand their role and potential liability. Maintain accurate records that show where the donations came from and how the money was spent. Make sure that the individuals with signature authority maintain proper records on all income and expenditures. A list of donors should be maintained so thank-you letters can be sent, and copies of receipts for all expenditures should be kept in case questions arise. Ask a banker to help you establish proper accounting procedures, or ask for pro bono help from an attorney or an accountant. Be honest with the public. Be prepared for questions, which may turn into accusations, concerning the use of donated funds. Designate one person -- who could be you or a trusted friend or family member -- to answer all questions concerning how the funds are being spent. Information concerning the number of donations or the amount in the accounts should never be released to the media. 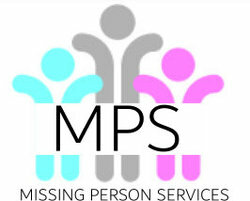 Specify what will happen to the reward in the event your missing loved one is located before the money is spent. Sometimes large sums of money in a reward fund are left unspent. Therefore, you need to establish written procedures for how the money is to be dispensed if it cannot be used for the reward. For example, you can specify that all donations over a certain amount are to be returned, if the donor is traceable, or that unused funds are to be donated to an organization or agency that helped with the search. Excess reward fund money should never be used for the family's personal expenses, because that was not the purpose of the fund. Again, talk with an attorney to determine how to handle this situation.